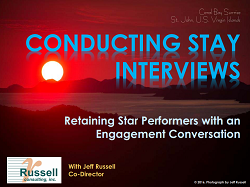 The Keys to Employee Retention – Russell Consulting, Inc. The Keys to Employee Retention – What are the time-tested strategies for retaining your top talent? Jeff presented RCI’s thoughtful and comprehensive approach to employee retention to an engaged group of HR professionals attending the monthly meeting of the Jefferson County HR Association. Click on the graphic above or here (The Keys to Employee Retention) for a PDF version of the PowerPoint slides. Contact RCI for more information on our human resource management and development workshops.